Future 500 ID Camps | Soccer Camps Jacksonville | setting the standard! Future 500 – setting the standard for ID Camps! Future 500 ID Soccer Camps Jacksonville. 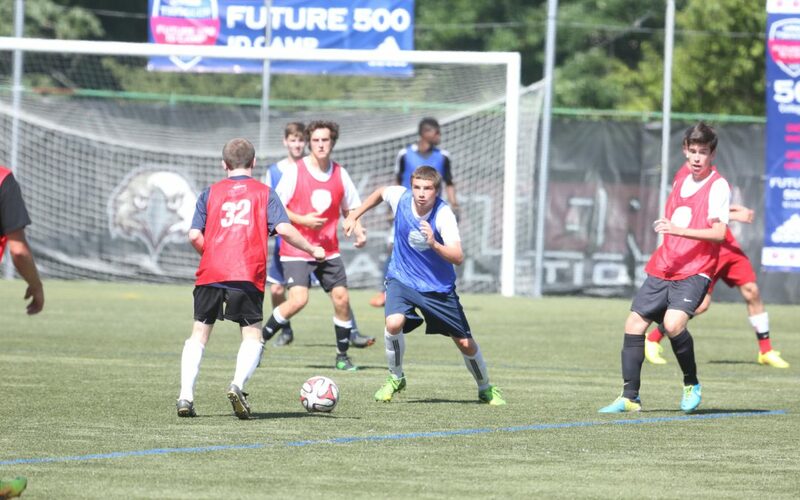 How can an ID soccer Camp as large as Future 500 ID Camps offer the benefits of a small soccer camp, while featuring over 75 top academic Colleges and Universities at EACH Camp? Future 500 provides a carefully selected mix of top NCAA Division 1, 2 and 3 colleges that are ACTIVELY LOOKING for talented student-athletes. No camp in the country offers a more balanced combination of NCAA Division 1, 2 and 3 colleges – and ALL 75 + colleges are actively looking for talented student athletes. That’s intentional – it’s the best way to offer as many recruiting opportunities as possible, to as many players as possible. Future 500’s Maximum Exposure Guarantee, ensures maximum exposure for every camper that attends a Future 500 ID Camp. In most instances, campers will be seen by every College Coach in attendance – often multiple times. We are not aware of a mid-to-large size College ID Camp in the country with a guarantee that LEGITIMATELY gets anywhere close to this See our Maximum Exposure Guarantee. Future 500 leverages technology and video to extend your recruiting reach. At no additional cost to campers, our HD On Demand and Live Stream Video Programs allow each camper to extend their recruiting reach well beyond the 75 + colleges that are at EACH Camp. Read More: Free On Demand. Free Live Stream. Future 500 provides the right balance of games – increasing opportunities to get recruited, without tiring players out and limiting their ability to show well. Future 500 provides a low 7:1 player to staff ratio. This ratio allows for a highly individualized approach for player-coach interactions that rivals the smallest of camps. College players, camp counselors and other support staff (which take our total staff to over 100) are not included in this ratio or we would advertise our ratio at 5 or 6 to 1. See more on Small Camp Feel. Future 500 Campers will be coached in small groups by college coaches. Every participant will participate in on and off field coaching sessions with 3-4 different college coaches, offering the same small group instruction as camps less than half our size. Our educational programming is extensive, professional and in depth. Because of our size, our corporate sponsors and thus the considerable resources available to us, we have the ability to offer seminars of the highest quality including our acclaimed Parent Education Seminar, Fueling the Body, SAT/ACT Tips and many other outstanding seminars to help educate and prepare campers to be successful college student-athletes. See more on Educational Seminars. Future 500 ONLY lists colleges that are attending this year’s camps and we don’t list colleges that attended previous camps. We don’t claim to have a large number of colleges attending without listing the actual colleges AND COACHES CONFIRMED. If you are considering other id camps, MAKE SURE you are counting the actual colleges on every page for every camp your are considering.